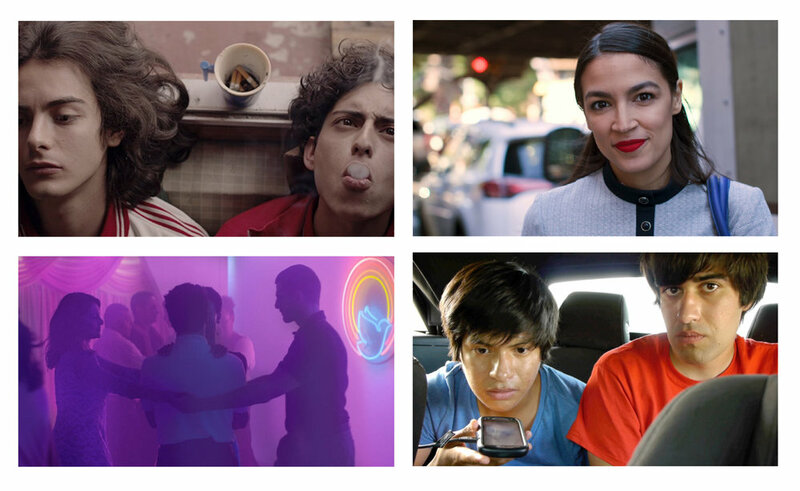 The Sundance Film Festival has just unveiled its lineup for its 2019 edition, which includes several national and international Latino films from Brazil, Colombia, Mexico, Uruguay, and the United States. The World Cinema Dramatic Competition will feature the world premieres of Divine Love by Brazilian director Gabriel Mascaro, the Colombian film Monos by Alejandro Landes, The Sharks by Uruguayan director Lucía Garibaldi, and This Is Not Berlin by Mexican director Hari Sama. Set in Brazil in 2027, Divine Love tells the story of a deeply religious woman uses her position in a notary’s office to advance her mission to save struggling couples from divorce. Whilst waiting for a sign in recognition of her efforts, she’s confronted with a crisis in her own marriage that ultimately brings her closer to God. Landes’ Monos follows eight kids with guns watch over a hostage and a conscripted milk cow on a faraway mountaintop. Set in Mexico City in 1986, Sama’s This Is Not Berlin tells the story of 17-year-old Carlos who doesn’t fit in anywhere, not in his family nor with the friends he has chosen in school. But everything changes when he is invited to a mythical nightclub where he discovers the underground nightlife scene: punk, sexual liberty and drugs. In The Sharks, while a rumor about the presence of sharks in a small beach town distracts residents, 14-year-old Rosina begins to feel an instinct to shorten the distance between her body and Joselo’s. The World Cinema Documentary competition will feature the world premiere of the Colombian film Lapü by Juan Pablo Polanco and César Alejandro Jaimes. Filmed the middle of the Guajira Desert, Doris, a young Wayuu woman, exhumes her cousin’s remains in order to meet her for the last time. Through a sensory journey this ritual leads her to confront death and blend the world of the dreams with the world of the living. Also having its world premiere in the World Cinema Documentary competition is the Untitled Brazil Documentary by Petra Costa, a cautionary tale for these times of democracy in crisis—the personal and political fuse to explore one of the most dramatic periods in Brazilian history. With unprecedented access to Presidents Dilma Rousseff and Lula da Silva, we witness their rise and fall and the tragically polarized nation that remains. The U.S. Documentary Competition will see the world premiere of three Latino-themed films: Knock Down the House by Rachel Lears, the U.S./Mexico production Midnight Family by Luke Lorentzen, and Pahokee co-directed by Brazilian director Ivete Lucas. Featuring Alexandria Ocasio-Cortez, Knock Down the House tells the story of young bartender in the Bronx, a coal miner’s daughter in West Virginia, a grieving mother in Nevada and a registered nurse in Missouri who build a movement of insurgent candidates challenging powerful incumbents in Congress. One of their races will become the most shocking political upset in recent American history. Midnight Family follows the Mexico City-based Ochoa family that runs a private ambulance, competing with other for-profit EMTs for patients in need of urgent help. As they try to make a living in this cutthroat industry, they struggle to keep their financial needs from compromising the people in their care. Set in a small agricultural town in the Florida Everglades, in Pahokee, hopes for the future are concentrated on the youth. Four teens face heartbreak and celebrate in the rituals of an extraordinary senior year. Two U.S. Latino films will have its world premiere in the Next Competition of the festival: The Infiltrators by Alex Rivera and Cristina Ibarra about a rag-tag group of undocumented youth—Dreamers—deliberately get detained by Border Patrol in order to infiltrate a shadowy, for-profit detention center; and Premature by Rashaad Ernesto Green a fiction film telling the story of Ayanna, who meets handsome and mysterious outsider Isaiah the summer before she leaves for college. Her entire world is turned upside down as she navigates the demanding terrain of young love against a changing Harlem landscape. Having its world premiere in the Kids section of Sundance is the fiction film Abe by Fernando Grostein Andrade. The Israeli-Jewish side of his family calls him Avram. The Palestinian-Muslim side Ibrahim. His first-generation American agnostic lawyer parents call him Abraham. But the 12-year-old kid from Brooklyn who loves food and cooking, prefers, well, Abe. Just Abe. Lastly, the acclaimed Colombian film Birds of Passage by Cristina Gallego and Ciro Guerra, will also be screened in the Spotlight section, dedicated to films that have already premiered at other festivals. Set in Colombia in the 1970s, Rapayet is a man torn between the desire to be powerful and his duty to uphold his culture’s values. His indigenous tribe, the Wayúu, ignores ancient omens and enters the drug trafficking business — where honor is the highest currency and debts are paid with blood. The 2019 edition of the Sundance Film Festival will take place January 23 through February 2, in Park City, Utah.